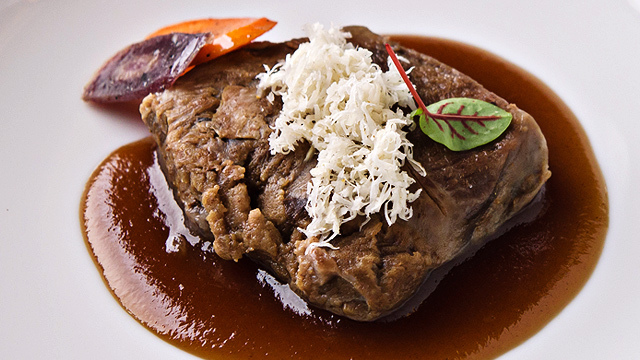 Chef Davide Oldani offers a fine dining experience that doesn't hurt your wallet. (SPOT.ph) An ala carte meal at a fine dining restaurant going for less than a thousand pesos seems almost mythical—what more a full three course dinner? But that's exactly what you'll get at FOO'D, with five-star quality three course meals going for P800 and four course meals for P1,200. But just because it's priced reasonably doesn't mean you should expect anything less than luxury food. Michelin-starred chef Davide Oldani always worked with Cucina Pop in mind—his philosophy that fine dining should be accessible to everyone without sacrificing quality. It's what drives D'O, his restaurant in Milan, and the same holds true here at FOO'D. 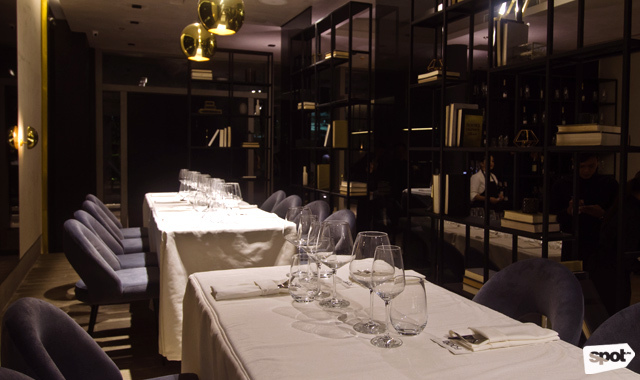 From the moment you are ushered in the clean modern interiors by the waiting staff, there is no doubt in your head that this will be a dining experience that is at par or will even outmatch the priciest establishments. There are no ala carte meals here at FOO'D, only prepared three course or four course meals, with the option to "upgrade" or switch certain entrees. 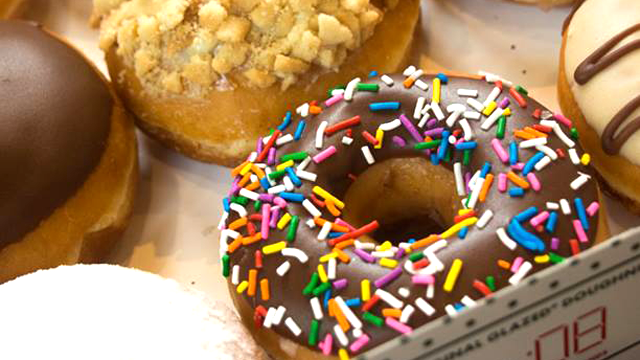 But even with an upgrade, the menu maxes out at less than P4,000. It's a surprising price tag, considering that chef Davide's creations can only be described as art. 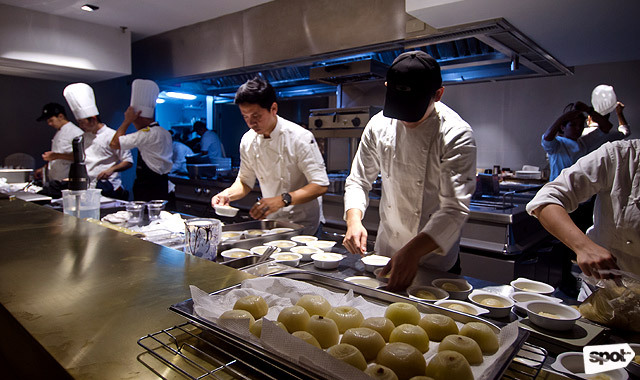 His attention to detail, to the way certain ingredients, with their varying textures and flavors, play off each other, is immediately evident with every dish set in front of us. 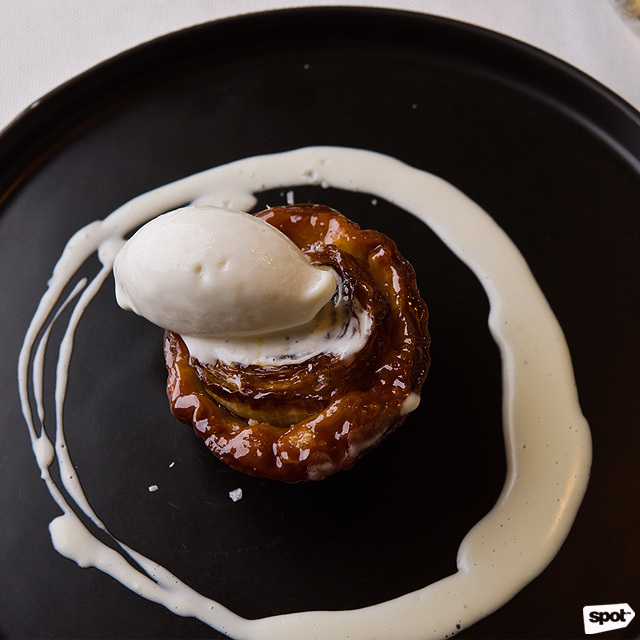 Take the starter, the Cipolla Caramellata, chef Davide's signature dish—a caramelized onion tart with a 24-months-aged Grana Padano gelato, and hot Grana Padano cream. Take a bit of each element in a single bite to get the full spectrum of flavor and texture—the sweetness of the onion against the saltiness of the cheese gelato and cream, the stickiness and crunch of the tart and creaminess of the sauce, the Grana Padano revealing layers of its flavors through the variation in temperature between the cold gelato and hot cream. 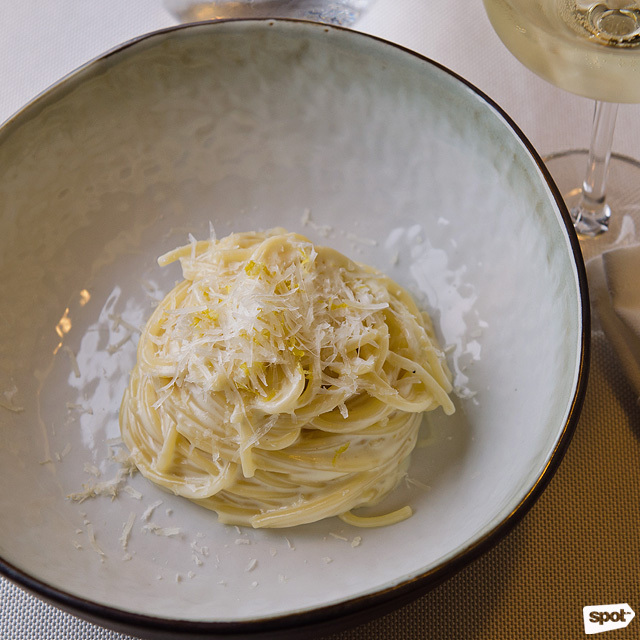 The zestiness of lemon is a welcome respite from the creaminess of the Cacio e Pepe, made with spaghetti and Pecorino Romano, with just a hint of spice from horseradish to add body to the dish. 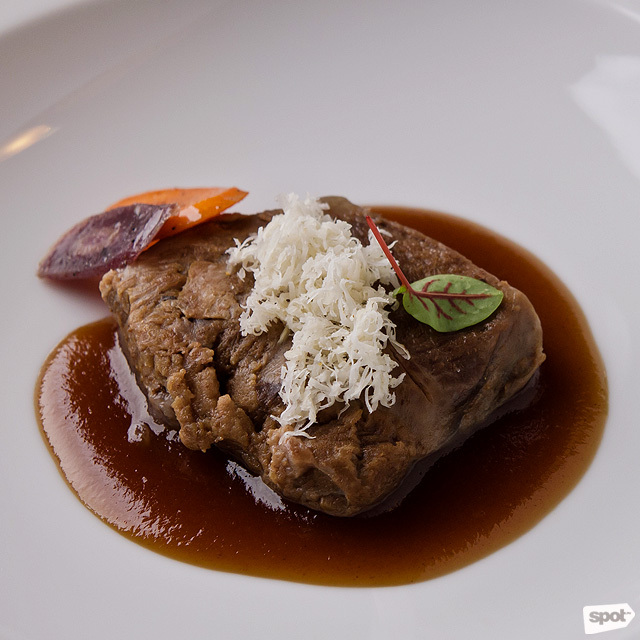 The veal of the Veal "All'Olio" is butter-soft with the fruity taste of the Bordelaise sauce complementing the mildly spiced meat. Another showcase of chef Davide's skill is the Lemon Curd. Don't let the simple name fool you; this dessert is anything but. 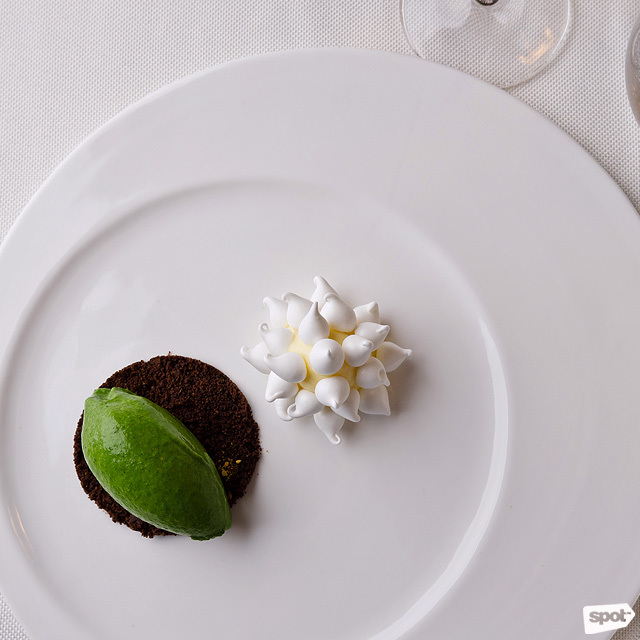 This plate is a beauty, with a pale yellow lemon curd covered in dainty dehydrated meringue, with a scoop of vibrant green lettuce gelato set atop cacao crumble and curry almonds beside it. Again, get a bit of everything in a single bite to fully appreciate the delicate balance chef Davide has created. The crunch of the meringue plays off the stickiness of the curd, and the tartness of the lemon is tempered by the mild sweetness of the gelato, with the bitterness of the cacao elevating each bite. 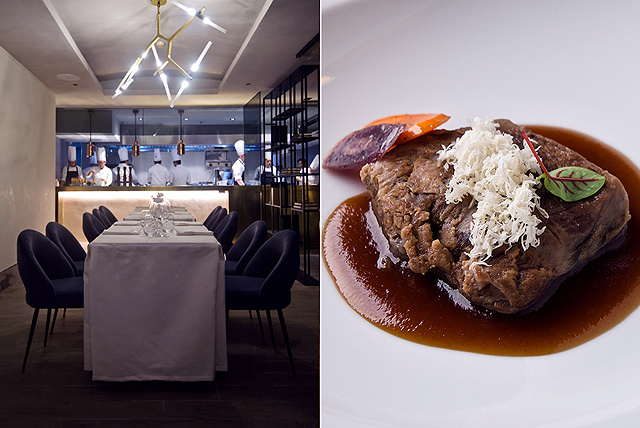 With his reasonable pricing, Chef Davide Oldani has made fine dining meals that can only be described as masterpieces accessible to casual diners. 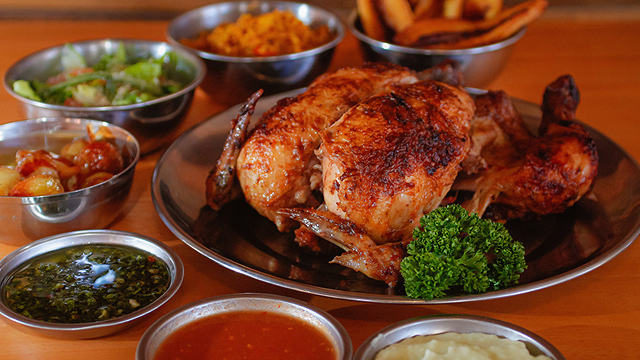 FOO'D will surely change the local food scene, and we cannot contain our excitement.